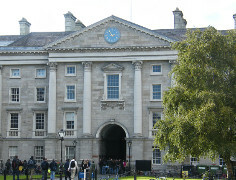 In the latest video from WiSER in Trinity Dr Patrick Prendergast TCD Provost and Linda Hogan Vice Provost talk about the Importance of Gender Equality. Both stress how gender equality is driving excellence in research in Trinity. “By having a commitment to gender equality we will really enhance the excellence in all of our activity especially in our research and education” says Vice Provost Linda Hogan. Linda Hogan says “We know that we can’t change what we can’t measure” and she acknowledges the role of WiSER in providing data -under the guidance of Prof Eileen Drew its Director . “We see that there is a very different career path and progression for women as for men.” She believes we need to see why this is happening though disaggregated data. She said is proud of Trinity’s lead in bringing Athena Swan to Ireland where each institution is going to have to set targets for constant evolution and change. Unconscious Bias training too is going to be rolled out on all interview boards she added. The Provost recognised that there is more creativity and innovation in gender diverse teams and said that he is proud of the way Trinity has engaged with that. For the Vice Provost she just wants to be there when the first Nobel Prize is being awarded to a woman scientist from Trinity!